Find out what the JRBS means to us and to the Blues scene. THE BLUES ARE ALIVE AND WELL IN CENTRAL AND WESTERN VIRGINIA! The JRBS is a 501(c) (3), non-profit, tax exempt, all volunteer organization governed by an elected Board of Directors. Since originating in 1995, the JRBS maintains a steady membership and growth in support of this musical art form, and is an affiliated member of the Blues Foundation, the umbrella organization for blues societies worldwide. Membership meetings are held on the second Tuesday of each month at 7:30 p.m. (call or check website for location). After a brief meeting, there is an open blues jam or music workshop among the musicians/singers in attendance. JRBS merchandise, including t-shirts, are available and we hold raffles for blues CD’s, tapes, and tickets to area blues shows. Occasionally, blues related catalogs and publications are available which may be of interest to members. Area merchants also offer discounts to JRBS members with valid membership identification. Our website (www.jamesriverblues.org) is updated continuously to reflect current activities of the society and to relay blues and cultural arts related news and events. Open blues jams are held which give local blues musicians and signers the opportunity to perform. All types of blues players are encouraged to participate – acoustic and electric, amateur and professional. The JRBS offers exclusively to its members a loan library of blues CD’s so members may have the opportunity to listen to the discs which are provided to the society by various record companies and independent artists. Each summer, the JRBS presents a blues talent competition in conjunction with the Sedalia Center's annual blues festival. The competition is designed for unsigned blues performers to compete for cash and prizes, including the chance to represent the JRBS at the International Blues Challenge in Memphis, TN. This festival is largely becoming one of the area’s most anticipated events. In the fall, the JRBS co-hosts the Mt. Cove Blues Festival in Nelson County, Virginia where fans can enjoy local and regional blues acts among the fall foliage of the beautiful Blue Ridge Mountains. The JRBS has initiated an Historical Marker Program, whereby funds, generated through grants and private donations, are used to erect metal signs along Virginia highways and byways honoring early Virginia blues pioneers who helped establish the music we know today as East Coast or Piedmont Blues. Lynchburg musician Luke Jordan, and southwest Virginia bluesman, Carl Martin have both had signs erected in their honor through this program. The very popular Virginia blues player, John Jackson, is now being considered for the next marker project. For further information, please contact the JRBS. The James River Blues Society is honoring the founders of the Virginia blues, and at the same time, providing a public record of their achievement by erecting historical marker signs along Virginia highways & byways. In addition, we are highlighting the importance of the East Coast or Piedmont style in the development of blues music. 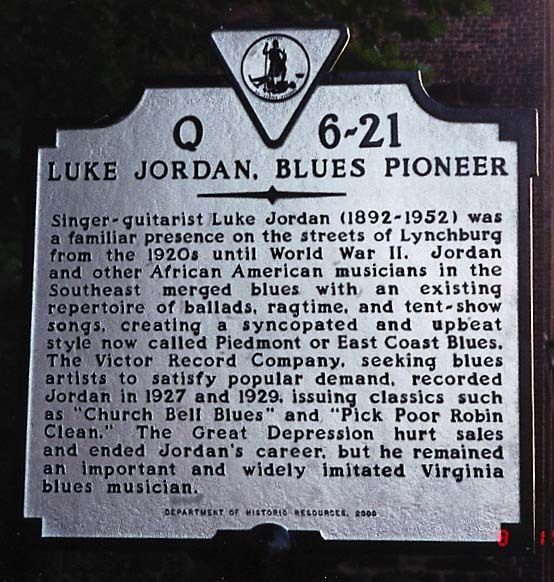 In the summer of 2001, the first sign in this series was erected in downtown Lynchburg in honor of Lynchburg blues pioneer, Luke Jordan. 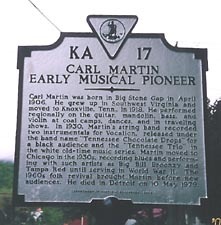 In 2004, a marker was dedicated to blues musician, Carl Martin in Wise County. 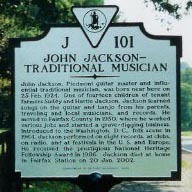 In the summer of 2005, the JRBS assisted Rapphannock County with the dedication of an historical marker for Virginia blues musician, John Jackson. In 2006, the JRBS will sponsor and erect two additional signs - one in Tappahannock County for blues musician, William Moore and one in Goochland County commemorating the 1936 Virginia Prison Recordings. 8th Annual Blues Talent Competition Winners! First Place - DEANIE BLUES BAND - (Amherst, VA) - Recipient of $400 cash prize, a paid performance at the Taste of the Blue Ridge Blues & Jazz Festival in Roanoke in Sept, and recording time at Catawba Sound Studio, and will represent the JRBS at the International Blues Challenge in Memphis. 7th Annual Blues Talent Competition Winners! First Place - BIG RICK & THE BOMBERS - (Raleigh, NC) - Recipient of $400 cash prize, a paid performance at the Taste of the Blue Ridge Blues & Jazz Festival in Roanoke in Sept, and eight hours of recording time at Catawba Sound Studio, and will represent the JRBS at the International Blues Challenge in Memphis. 6th Annual Blues Talent Competition Winners! First Place - Proffitt & Sandidge - (Amherst, VA) - Recipient of $400 cash prize, a paid performance at the Taste of the Blue Ridge Blues & Jazz Festival in Roanoke on Sept. 18, and eight hours of recording time at Catawba Sound Studio, and will represent the JRBS at the International Blues Challenge in Memphis. 5th Annual Blues Talent Competition Winners! First Place - The Wiyos - (Richmond, VA & Brooklyn, NY) - $400 cash prize, paid appearance at The Taste of The Blue Ridge Festival, and will represent the JRBS at the International Blues Challenge in Memphis. Our big THANKS to Big Bertha & The Highrisers, Tray Epps, Deanie Blues, Proffitt & Sandidge, Westcott Brothers, Wiyos, Doc's Blues Revue, Bluzonia, Bluesville, & Red House Blues Band for making the Blues all day. First Place - Tim Morgan - (Norfolk, VA) - $300 cash prize, paid appearance at The Taste of The Blue Ridge Festival Sept 14, and will represent the JRBS at the International Blues Challenge in Memphis.